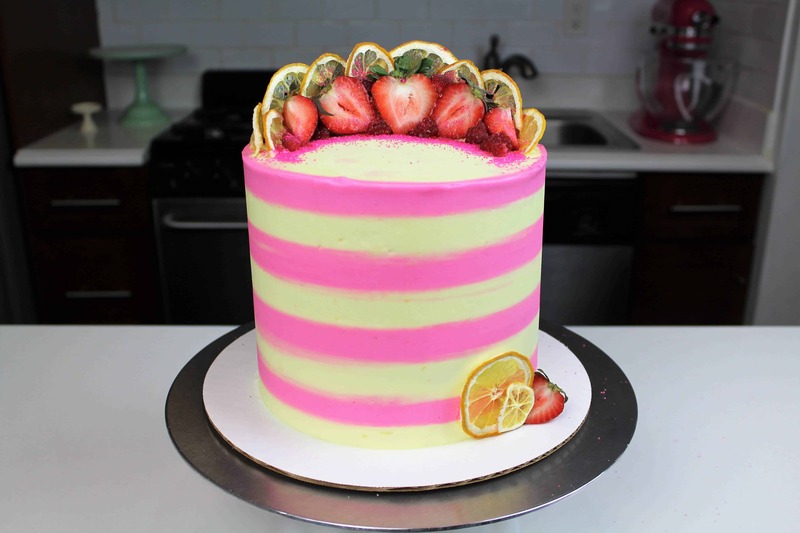 I felt compelled to make a pink lemonade cake before summer comes to an end! I’ve always wanted to make a strawberry cake, but really struggled getting a strong strawberry flavor in my cake layers! Most strawberry cake recipes use strawberry jello, and while I was extremely hesitant to try it, it truly is the best way to incorporate a bright, vibrant strawberry flavor into cake. You have to try it to believe it!! 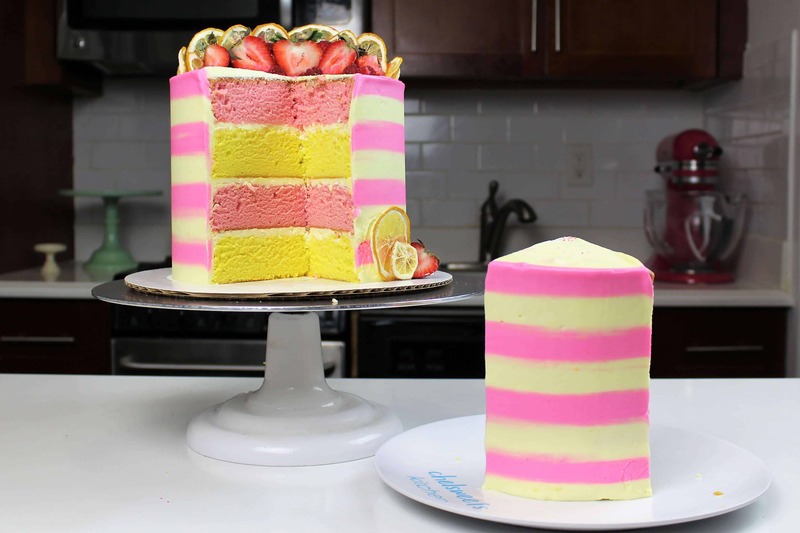 I made this cake using two strawberry cake layers, and two lemon cake layers. I frosted it with a lemon buttercream, and used dehydrated lemons and fresh berries to decorate this cake. Preheat oven to 350°F. Grease and line four 7? round pans. First, make the lemon cake better. Mix together all dry ingredients (flour, baking powder, sugar, and salt) in a stand mixer with a paddle until fully combined. Mix chunks of butter slowly into the dry mix on a low speed. Continue to mix until no chunks of butter remain, and the mixture becomes crumbly. Pour in egg whites, and mix on low until just incorporated. Mix in the buttermilk in two installments, on a low speed. Add in lemon extract, lemon zest, and oil, and mix at a low speed until fully incorporated. Scrape down the sides of the bowl with a spatula, then beat on medium high for about 30 seconds. Next, make the lemon cake better. Mix together all dry ingredients (flour, strawberry jello mix, baking powder, sugar, and salt) in a stand mixer with a paddle until fully combined. Mix chunks of butter slowly into the dry mix on a low speed. Continue to mix until no chunks of butter remain, and the mixture becomes crumbly. Pour in egg whites, and mix on low until just incorporated. Mix in the buttermilk in two installments, on a low speed. Add in strawberry puree and oil, and mix at a low speed until fully incorporated. Scrape down the sides of the bowl with a spatula, then beat on medium high for about 30 seconds. Divide batter evenly between the prepared cake pans, pouring half of each batter into a pan. Bake for 35-38 minutes, or until a skewer comes out clean. Allow to cool for 10 minutes, then run an offset spatula around perimeter of the pan to separate the cake from the pan. Place cake layers on a rack to finish cooling. While the layers bake, prepare the frosting. Beat the butter on high for 30 seconds with a paddle attachment, until smooth. Slowly add in the powdered sugar, 1 cup at a time. Alternate with cream, adding 1 tablespoon at a time. Once fully mixed, add in the lemon extract, lemon zest, and salt, and beat on medium low until the ingredients are fully incorporated, and the desired consistency is reached. If the frosting is too thick, add in cream (1 teaspoon at a time). If the frosting is too thin, add in more powdered sugar (quarter of a cup at a time). Divide the frosting, place 3/4 in one bowl, and 1/4 in another. Color the bowl with 3/4 yellow using a few drops of yellow gel food coloring, and color the other bowl with pink gel food coloring. 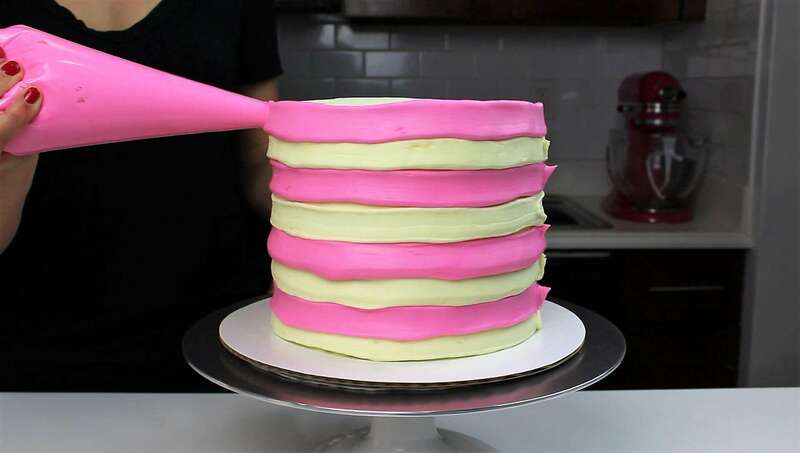 To assemble the cake, frost each cake layer with buttercream. You can also add some of the fresh berries between each layer. 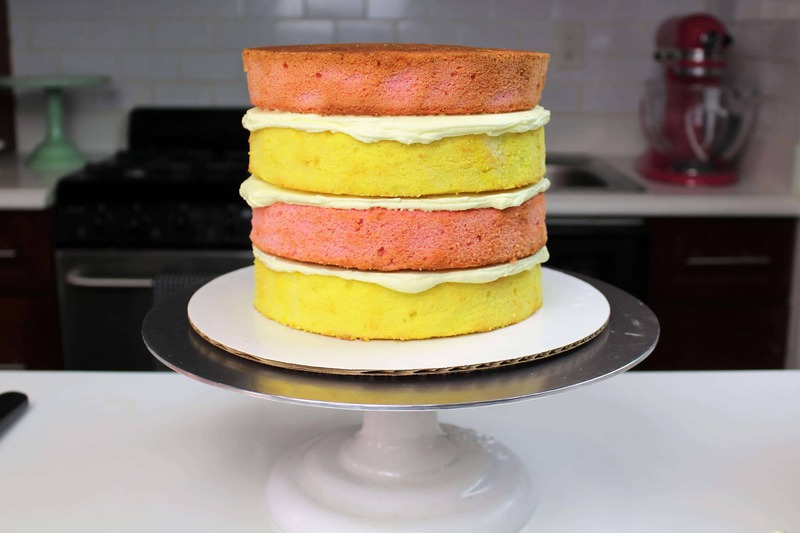 Alternate yellow and pink layers, then apply a crumb coat. Freeze cake for 5 minutes to allow the crumb coat to set, then use remaining frosting to add a second layer of frosting using piping bags. I cut my bags to have an opening of about 1.5 cm. Smooth with a bench scrapper. Add fresh berries, citrus accents, and sprinkles in a semicircle around the top of the cake. How would you convert this recipe for the cake cooking times & layers if using a 6 inch or 8 inch pan? a couple minutes less for 8 inches, and if using 6 inch cake layers, make at least six layers, and bake for about 30 minutes! By crumb coating, do you mean applying a very very thin layer of the frosting? No! this cake recipe bakes flat, which makes it amazing for making layer cakes, but makes terrible cupcakes! I recommend using my classic vanilla cupcake recipe, and adding 1 tsp of lemon extract and the zest of 1 large lemon. Hope that helos! Does the strawberry puree have to be room temperature or once I take it from the blender directly put it in the stand mixer?? I recommend it being room temp! I’m using this recipe with 9 in cake pans, should I use just three pans or would you suggest more than three? I also wanted to ask about the buttercream, does your recipe allow you to frost the entire cake with the crumb coat and have the amount to decorate with as well? Or do you always have to make more? I seem to always run out of icing after I’ve done my crumb coat and the next layer leaving me with nothing for the decoration portion. I’d say just make 3 layers! And yes, I just updated the recipe!! Usually I make extra frosting when piping on stripes! Would I be able to use this recipe to make strawberry cupcakes? Or, should I add strawberry jello to the vanilla cupcake recipe? I would add the jello to make vanilla cupcake recipe, and reduce the amount of sugar you add! Hi- can I make this with lemon juice instead of extract? I just dont feel like buying lemon extract .. ill never use it!! it won’t have quite as strong of a flavor but yes you can! If I were to make 10 inch cake with this recipe should I just double each cake batter? I would still want the 4 layers. Also what temperature and how long should you bake them? Would the baking instructions be the same for a 9 inch cake? Thank you ahead of time! I am wanting to make this strawberry cake! Can you give me measurements and directions for just a strawberry cake? I’d recommend just adding half a cup of crushed, freeze dried strawberries to the batter! Is there a difference in using egg whites vs whole eggs? It just makes the cake a tiny bit lighter! but you can use 5 whole eggs in place of the cup of egg whites! Can I have the recipe for the strawberry puree, please?